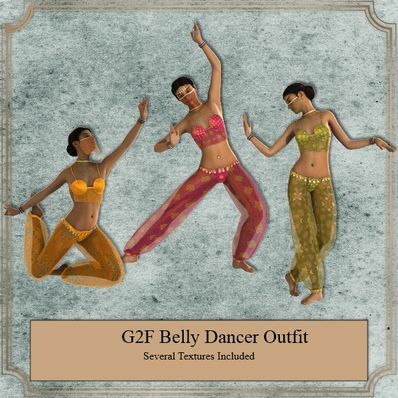 Belly Dancer Outfit for Genesis 2 Female for use in Daz Studio 4.6. This is one of my favorite outfits! Thank you so much for all your great work! Thanks for these beautiful outfits. Wilmap, you're saving my creativity. I've been looking for this for the last 1 year & I finally found it here! Thank you, man! You're awesome! Wow! What a darling outfit, and all the extra goodies as well. You are so generous, really appreciate all your attention to detail and your great generosity. Thank you. I was looking for this kind of costume, thank you! Thank you, this is lovely. Yes all of my items now contain Metadata. Nice Stuff, Question Does your Stuff have Meta Data? Because Big packs are a pain to set-up. This is not a complaint....Thank You for your great outfits/packs ...ect. Thank you been looking for something like this. Thank you very much for this excellent, lovely outfit! Tonight I'll throw a fancy party in klausdbg's 'Patio revisited' (-> sharecg.com)! Wow, just when I thought this site cannot get any better! Thank you so much for this amazing product. Thank you for this lovely outfit and accessories! Thank you so much! Wonderful outfit! Your new site works well, and as usual everything you do is awesome. Does seem to be a problem. We are looking into it. Please be patient. Downloading fine here. Can you try again please?